Met with Gulla & Lis today to add a last artistic touch to our Suitcase Book and to celebrate the way it has turned out – we´re so absolutely pleased with the result – and we had so much fun in the process! We have managed to (more or less) stick to the subject and pack the suitcase according to the initial idea of investigating the art of travelling/living: “go easy – keep it simple”. Actually we’re so happy about the result we plan to do another collaborative suitcase book project in November for the Vilnius Trienniale! 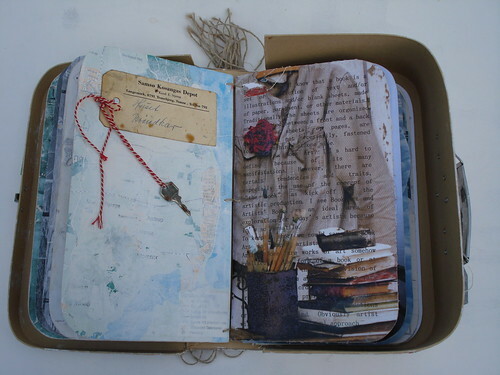 This entry was posted in Artists´Books, Inspiration. Bookmark the permalink. 6 Responses to Suitcase Book finished! Read the other suitcase post but didnt comment. I just love it. And the front of the case which you decorated, just delicious. What fun. I love what you’ve done with this idea! When I was still living in New Zealand we had a touring group that would visit us in the Library where I worked with a story in a suitcase for the children. The suitcase was opened and a whole other world spilled out, a brilliant idea and totally captivating. Stunning book – funny all my books come in suitcases too.